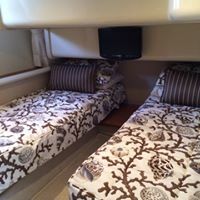 We had the pleasure of designing custom bedding for this beautiful Azimut Yacht. The client was looking for neutral tones that had a bold print. 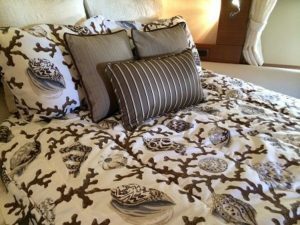 Custom boat mattress toppers, sheets and bedspreads add to the comfort while the print accents the interior with a nod to coastal design. This client plans to use the bedspreads as a day cover and to sleep with the sheets and blankets. 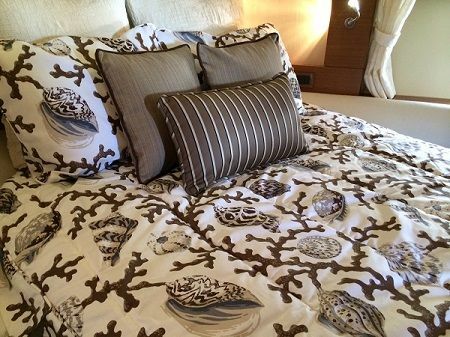 Custom yacht bedding keeps things looking neat and is helpful when making the bed.